You may be surprised to see this recipe calling for ripe bananas. If you look at the Monash Low FODMAP app, at first glance ripe bananas look like they would be a no-go on the low FODMAP diet because they are listed as high FODMAP (or red). But, serving size matters. If you click into the ripe banana listing on the app, you will see that ⅓ serving (⅓ medium banana or 33 grams) actually turns into a low FODMAP (or green) serving. Although many of us should be able to tolerate a little more (~ 1/9th of this recipe), I’ve kept the serving sizes of this bread conservative (1/12th bread per serving) to help account for the small amount of FODMAPs that may be found in the other low FODMAP ingredients. A low FODMAP diet is not a no FODMAP diet and even low FODMAP (green) foods can contain small amounts of FODMAPs. The diet has been designed so that multiple low FODMAP (or green) servings of foods can be eaten at the same meal, but there is a chance, if we eat too many low FODMAP foods, to push us over the low FODMAP threshold and trigger symptoms. To start, heat your oven to 325°F. Grease a bread loaf pan. I like to use nonstick cooking spray. Set your greased pan aside. In a medium bowl, whisk together the coconut oil and maple syrup. Add the eggs and whisk again. Then add the mashed bananas, low FODMAP milk of your choice, and vanilla. Whisk until everything is well combined. In a large bowl, mix together the gluten-free flour, baking soda, salt, and cinnamon. Add the wet ingredients into the dry mixture and stir until mixed. Gently fold in the all but 1-2 tablespoons of the chopped walnuts. 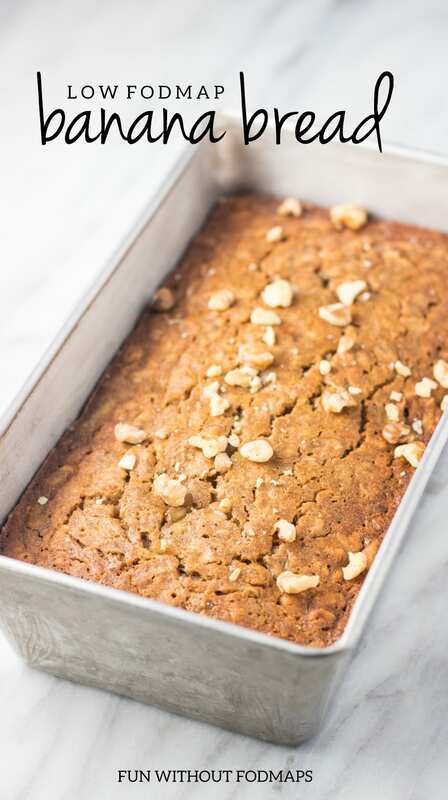 Pour your banana bread batter into the greased loaf pan. Sprinkle with the remaining 1-2 tablespoons walnuts. Bake 55-60 minutes or until done. Allow the bread to cool before slicing and serving. To help stick to the suggested serving size, I would slice the entire loaf evenly into 12 slices after it has cooled. One low FODMAP serving equals one slice. 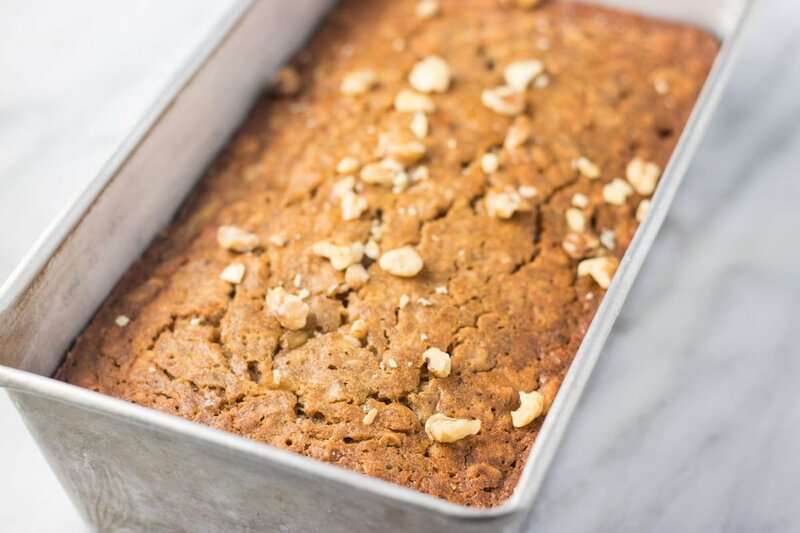 Enjoy a slice of this Low FODMAP Banana Bread just as it is. Or, serve with a couple of hard-boiled eggs for a boost of protein. Preheat oven to 325°F. Grease a bread loaf pan and set aside. In a medium bowl, whisk together the oil and maple syrup. Add the eggs and whisk. Then add mashed bananas, milk, and vanilla. Whisk until well combined. In a large bowl, mix together the gluten-free flour, baking soda, salt, and cinnamon. Add the wet ingredients into the dry mixture and stir until mixed. Gently fold in the chopped walnuts. 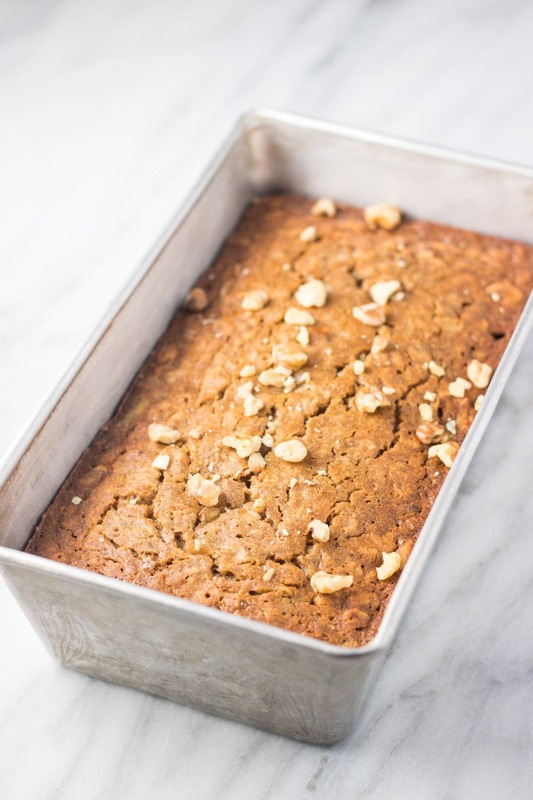 Pour batter into the greased loaf pan. Bake 55-60 minutes or until done. Allow the bread to cool before slicing and serving. Ripe Bananas: According to Monash University, a low FODMAP serving of ripe bananas is ⅓ medium or 33 grams. Low FODMAP Milk: I use unsweetened almond milk or macadamia milk. Lactose-free milk or another low FODMAP milk alternative may be used. Walnuts: According to Monash University, a low FODMAP serving is 10 walnut halves or 30 grams. Thank you. Will be baking this tomorrow. Nice to find low Fodmap recipes. I do have a question. Are gf oats low fodmap? I typically make my own oat flour for baking but I think it triggers flare up with my IBS at times. I’m in the process of ruling out foods that bother me. Hi Joann! Oats (GF or not) are low FODMAP at the recommended serving sizes. I invite you to check out the Monash app for serving sizes. With that said, even in low FODMAP portions, some people find oats to be a non-FODMAP trigger. 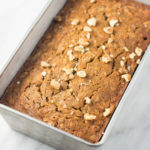 This is probably the BEST banana bread recipe I have ever used! It’s easy, delicious, and sooo moist. My husband loved it too. I was curious how the texture would be since it’s gluten free, but you really can’t tell the difference at all. I used unsweetened almond milk for my milk, King Arthur GF Baking flour with 1 tsp of xanthun gum, and also added about 1/2 cup chocolate chips to make it a nice treat for dessert. In my oven, I did have to bake it for 1 hour and 15 min instead of the recommended 55-60 min at 325 degrees. Thank you so much for this great looking recipe! I am following a low-fat diet for gastroparesis. Could I replace the oil with lactose-free yogurt? Thanks so much for all of the resources you share. I have enjoyed several of your recipes, and you’re so generous to make them freely available! Hi Ally! I know yogurt can be used in some recipes, so it might be worth a shot! I don’t tolerate dairy (except ghee), otherwise, I’d try it out myself. 🙂 Let us know how it goes if you try it out! Aww thanks, Haylee! So glad you liked it! I altered this recipe accidentally when I made it the first time. The ingredient list calls for oats, and since it wasn’t listed under the instructions part I overlooked adding them. 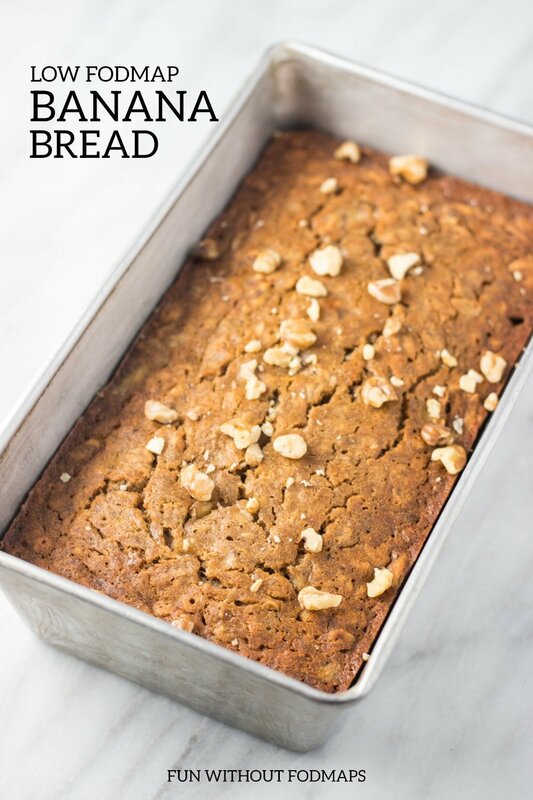 I LOVED this bread, and I think it was the cinnamon, and I only used 2 bananas b/c that’s what I had on hand. 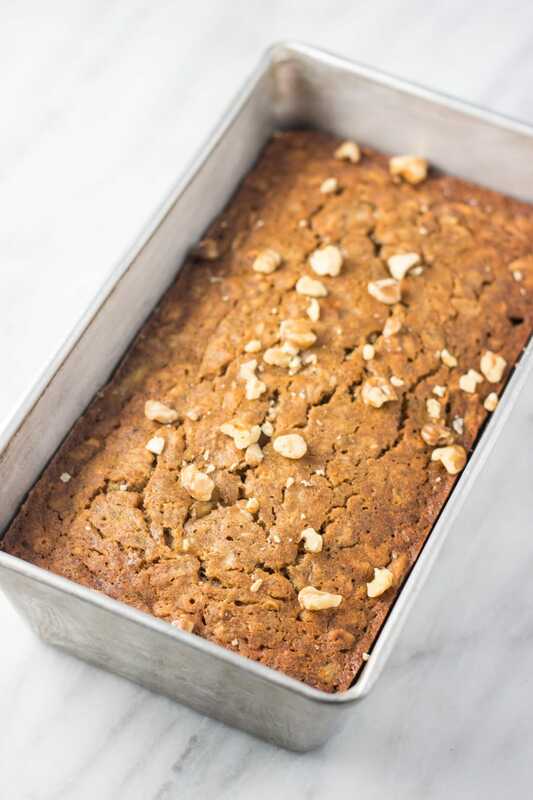 Often banana bread tastes too banana-y. I made this a 2nd time adding the oats. I liked the way it turned out the first time without the oats but I think it was a texture thing. Thanks for your recipes! I am excited to try the Strawberry Rhubarb Crumble next. I just forwarded your blog link and some recipes to my mom who lives in another state. My sister has had issues with her GI for years, and until I was diagnosed with IBS last year in November, I never realized that my sister may also have IBS!!! Her symptoms are so similar to mine when I am not eating right, and I haven’t been for a couple weeks. She lives in a group home as she has special needs, and although they try to cook somewhat healthy, I am pretty sure my sister is eating those high FODMAP foods that may be causing issues, of course it’s not intentionally. Hoping they can try some Low FODMAP meals & recipes in order for her to have some relief and maybe work with a dietician or even have someone come in to her group home and prepare some meals and make a list of things she should avoid. Hey Paula! Sorry for the delay in responding. The oats were an oversight on my part. I typically test multiple versions of each recipe and forgot to take out the oats in the final ingredients list. 🙂 Thanks for catching that! Am looking for a sweet Low FODMAP treat and cannot with to try this! What would be a good substitute for the eggs? Hi Kris! You could try “flax eggs” – typically it’s 1 Tbsp. flax seeds with 3 Tbsp water per “egg”. I haven’t tried it in this recipe, but to make a “flax egg”, you just whisk the ground flax with the water until it’s kind of gelatinous and then add the “flax egg” to the baking mixture just like you would eggs. Also just an FYI – a low FODMAP serve of flax seeds is 1 Tbsp. or 15 grams. Let us know if you try it out! So good! My whole family loved it. We added dairy free chocolate chips. Ooo chocolate chips would be a fun addition! I’ll have to try that. Thanks for sharing, Kellie! Yum! I several overripe bananas waiting to be baked. Have you ever tried making your own GF flour mix using rice and tapioca flour? I am experimenting with this and hope it turns out. Hi Elizabeth! I have a long time ago before there were a lot of ready-to-use gluten-free options available. Right now, I prefer the time-saving option, but maybe someday I’ll play around with making my own again. Hope it goes well!